You can read all about the many different incarnations of the Commodore 64 in the computer’s very well written Wikipedia article, but here I just want to tell my own personal story and the C64s I own. The C64 was not actually my first computer – that was a Kaypro 2X CP/M machine on loan from another family member in late 1988, but in March 1989 I got my C64 after previously having seen one owned by a friend. It was the best choice at the time and one I did not regret – because the C64 was already at the end of its incredible career, it was not particularly expensive anymore, but still had a lot of potential. At our local electronics superstore, I remember having the choice between the classic C64 in a rejuvenated breadbox case sold as a flashy package called Video Supergame 64 bundled with a games module and a joystick and the more professional-looking C64-II. I chose the latter, because I was not really interested in a gaming computer in the first place, but a real computer. I can’t remember the exact occasion, but I must have had to do something with the fact that I had saved up a lot of pocket money and was able to pay for it myself. The Commodore 64 was a very advanced machine for the early 1980s – I won’t go into all the technical details here, but here are just some numbers: the MOS 6510 CPU (in later models like my own C64-II the compatible MOS 8500 was used) ran with 1 Megahertz, the RAM was 64 kilobytes big with about 38kb available for BASIC programs. 16 kilobyte ROM contained the kernel and BASIC interpreter and another 4 kilobyte ROM had the character set. The VIC-II graphics chip was able to display 320×200 pixels in two colours and 160×200 with 16 colours, the text mode was only 40×25 but there were two fonts available, one with a set of graphical symbols. The SID sound chip was capable of delivering three voices with incredible manipulation possibilities. There were ports for two joysticks or other input hardware, a user port for program modules and other purposes, a datasette port, a serial bus for connecting floppy drives and printers, a combined video/audio output with an s-video compatible signal and an rf-modulator providing a direct television signal. In short, when the C64 was introduced in August 1982, it had capabilities no other home computer had at the time. The computer itself consisted only of the keyboard unit, in which everything but the optional external devices and the power brick was contained. To get the machine running, you only had to plug it into a monitor or television, because the BASIC system was contained in the computer itself and did not need to boot from an external storage device. A cassette or floppy drive was, of course, also necessary, but to just switch it on and type something in only the computer itself was needed. The operating system was simply the BASIC programming language interpreter itself from where everything was operated. 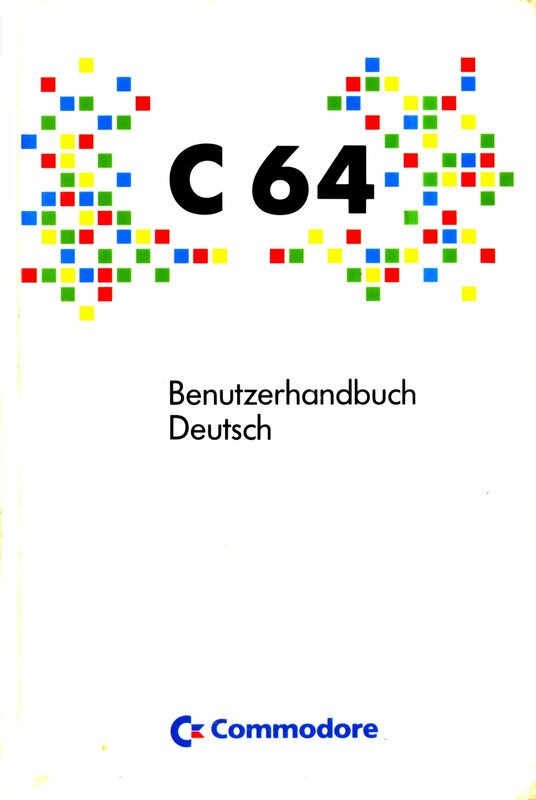 This did not mean that the computer was limited only to this language, but it was practically the operating system of the C64. 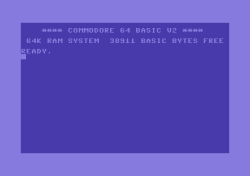 The BASIC version was not even the most powerful Commodore had in store, there were earlier business computers which had at least BASIC 4.0, but for some reason Commodore thought that BASIC V2 was enough for the C64. This meant that a lot of things like graphics and sound programming had to be done with cryptic commands directly addressing certain memory adresses, but exactly such quirks made the Commodore 64 so charming. The electronics store (Media Markt for German readers) did have a floppy drive for sale, but since it was still too expensive forme at the moment, I had to go to another store to get a tape drive, the famous Datasette, together with some games to try out the computer. and clueless as I was I accidentially got the wrong tape drive for a Commodore Plus/4 and had to exchange it. This is why on the very first powerup of my Commodore 64 I did not even have the means to save or load a program – I also did not have a monitor yet, only an old 10-inch black and white television. But that did not keep me from entering a few of the smaller example programs from the surprisingly good 175-page manual which was sold with every Commodore 64. Typing in a few BASIC commands like the famous one-line maze generator 10 PRINT CHR$(205.5+RND(1));:GOTO10 and getting an instant and coherent response from the computer was utterly amazing. Luckily I had already a little bit of programming knowledge from the Kaypro, so I was able to follow and learn what the programs were doing. The first very necessary investment after getting a working replacement Datasette (with some rather disappointing games, see my previous article) was a monitor, but colour was less a priority than a clearer image and on occasion I was able to use the big colour television to try out the C64’s colour capabilities. The cheapest alternative was a 12 inch black-and-white monitor from Philips, which had an amazingly crisp image. I also was able to replace the cumbersome Datasette with the 1541-II Floppy Drive only a few weeks later, mainly because there was a lot of interesting software available only on disk – but more about software and games for the C64 in a separate article. At the end of 1989, my Christmas present was a colour monitor for the C64, this time from Commodore. The 14 inch 1084S was one of the best monitors available at that time for the C64 and was even fit for the future because it was also the display of choice for the Amiga. But getting the C64 in full colour in good resolution was amazing enough, because the television antenna output was somewhat blurry and the split chroma/luma signal provided a very stable image. The Commodore 1084S was not only my C64 monitor, but I was also able to use it later with my Amiga and it still works perfectly today, although I only use it occasionally for my Commodore computers or as a video monitor. The Philips black-and-white monitor also had a long second life as a video monitor, but it sadly broke sometime in the late 1990s. 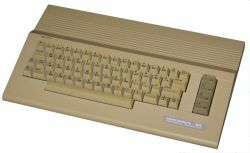 I only used the Commodore 64 actively from March 1989 to November 1990, when I got my Amiga 2000 – but it was an invaluable time that today seems much longer to me. When the Amiga arrived, I did not stow the C64 away or sell it – I just put the monitor on top of the Amiga and was even able to leave the C64 connected because it used a different port of the monitor and I only had to push a button to switch between the two. In 1995, when I already had my first PC after the Amiga, I discovered that my 1541-II floppy did not work anymore and only then I put the C64 back in its box – but this was not the end of the Commodore 8-bit era for me, because as a replacement I was able to get a working C128D, which is, of course, compatible to the C64. In the early 2000s I also rummaged around Ebay and bought two more C64 – this post 8-bit era from 1995 on will be featured in the next posting of the Vintage Computing series. There is a lot of other hardware for the C64 I had in 1989 and 1990 which I have not mentioned yet and which will be the subject of separate articles – most notably the Commodore 1351 Mouse, the Competition Pro joysticks and the Citizen 120D printer. But first, the next posting will be about those other Commodore machines I acquired long after my “main” C64 era. In closing, here’s the front view of my actual C64 box packaging. Note how the keyboard differs from my C64 – on the box, the graphical symbols are printed on the front of the keys, my unit has them on top directly under the letters.